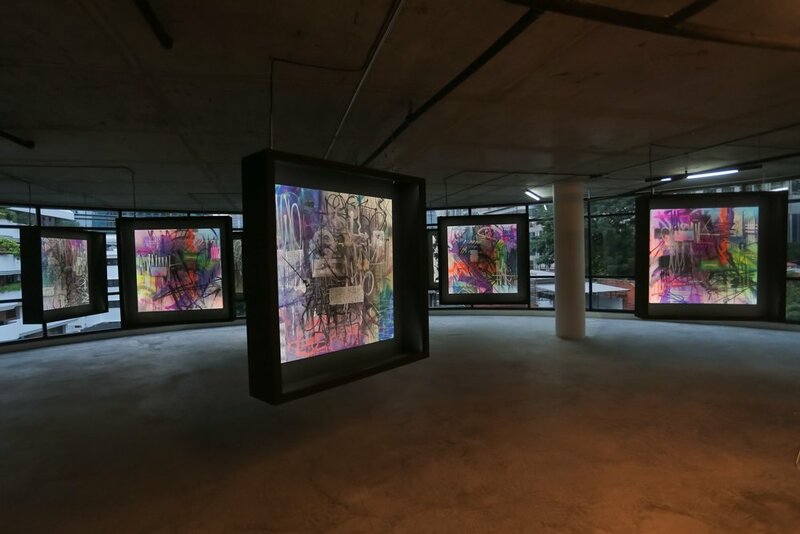 Described as one of “the best and most respected artists in his field” by the Washington Post, "SABER", also known as Ryan Weston Shook, is an American fine artist who originated as graffiti artist. Rising to international fame at the age 21, Saber created the world’s largest graffiti piece on the bank of the LA River, which was visible and documented by satellites in space. He, over years of dedicated and often dangerous painting helped bring public awareness to the true Art form of graffiti. His work has influenced a generation of artists and graphic designers, and has become an influential part of modern entertainment, social media, and art for and involved in social reform. He continues to make his vibrant, mesmerizing and often political paintings from his home in Los Angeles with his wife and two young children. His art can be found in galleries and private collections around the world. Meanwhile he continues to create public conversation about and push the boundaries of what art should (or shouldn’t) be confined to. Decoding City of Angels is a representation of two cities bearing the same name ideology & aesthetic. The artist SABER born & raised in the city of Los Angeles or City of Angels to him and many others in Los Angeles means that they are of a fallen angels assigned to Earth to influence, help, and pass on inspirations one person to another. His duty or job here at this time is to influence, help and also pass on inspirations through his art. They were formally done in the streets in his early years as a young graffiti artist that paints and beautify the grey street of Los Angeles turning them into colorful murals that influence, help and inspires all walks of life. Bangkok or City of Angels known to both locals and visitors from around the world, share similar names and aesthetic to Los Angeles or City of Angels. With Saber's first solo show in Thailand the idea of Decoding City of Angels is about a spiritual transitions of East meets West and the re-discovering of another City of Angels where the artist is spiritually co-aligned with new tradition, new ideas, new thoughts and new inspirations of what City of Angels truly means. Upon arriving in Bangkok or another City of Angels besides Los Angeles, I find this whole new environment meticulously cultured with traditions, smiles, laughter and joy. Like all modern metropolis, I discovered Bangkok to be filled with old well preserved traditions fused in with new modern day cultures in a well balanced way. These moments & visuals has inspired me to create a body of work that reflects the beauty & abstraction of this City of Angels through my practice of Los Angeles graffiti hand styles calligraphy. Abstracted in a calligraphic way I painted these first series of paintings called “To Make Believe That Light Is Sound” reflecting the city in a suspended aesthetic way. Then comes the “Street Poetry” pieces capturing the layers of time buried within the esoteric language that transpires stories. Each city have walls with different stories, each stories have a life of its own that speak to us in a poetic way that transition onto other suspension of layers of calligraphic writings within the walls that are reflected in my paintings. Like a free flow of energy within this new environment empowering and inspiring me to create pieces in a state of mind that if I can not achieved if painted these paintings back in home Los Angeles. Bangkok City of Angels and Thailand have influenced and inspire me as an artist and my work a lot. One of the biggest influences that impacted me as an artist and a person was the Royal Cremation Ceremony of the late King Bhumibol Adulyadej, in which I found the entire city of Bangkok & Thailand come together under these moments of silence & respect. The color “Black” and emotions hold strong in my memories and respect. Coming from America, I have never seen an entire country come together in a deep way. This bring forward a series of monochromatic paintings that I am bringing out the equations of balance and energy. These brought me deeply into the culutre of this City of Angels in a meditative state and each snapshot is energy captured in a still energy in motion. Energy, meditative state and the culture here have transformed my 25 years of wildstyle calligraphic graffiti paintings into a new pure form of energy that subtracted and build upon this new energy of idea I called wildstyle abstraction expression. At the end I seek for purity as an artist, person, within my work show here in Bangkok, my City of Angels.